Epson PictureMate 100 Personal Photo Lab Compact Printer – this excellent compact printer allows you to print what you like, when you like, wherever you like! The prints are brilliant, high quality photos which are smudge-free and worthy of framing! The Epson Picture Mate 100 can print 10 x 15cm (4 inch x 6 inch) photos from any digital camera, memory card or Apple/Android camera phone, plus you can preview photos using the neat 1.5 inch colour LCD preview monitor. A typical photo print takes around a minute and a half, plus the unit is light and easy to carry using the handle provided. HP Officejet 100 Mobile Printer – this Bluetooth enabled compact printer can print up to 500 pages on a full battery charge at print speeds of up to 22 ppm black or 18 ppm in colour. You can print directly from all compatible mobile devices including those running Windows Mobile, BlackBerry, Palm OS and Nokia Symbian mobile operating systems. Printing professional-quality documents on the go is easy using built-in Bluetooth wireless technology on the HP Officejet 100 Mobile Printer. 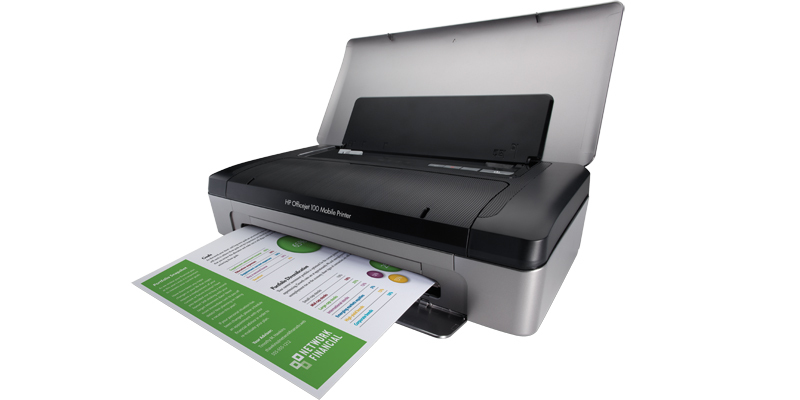 Designed for easy and reliable printing, the HP Officejet 100 features an intuitive control panel with battery life indicator light and Bluetooth on/off button. Brother PJ662 PocketJet Bluetooth Mobile Printer – the PocketJet offers a rugged yet compact mobile printing platform which will easily fit in a computer bag or can be mounted in a vehicle to create a mobile office. Using direct thermal printing technology, the Brother PJ662 PocketJet ensures reliable print quality and uses no ink or toner so there’s no mess or running out of ink on your travels.